So You Wanna Build a Casket? You're considering building a casket. Maybe you need a prop for Halloween or a movie set. Maybe a close friend or relative has put you up to the task of building a casket for a funeral. Regardless of your reason, budget, or skill level, this article will help you prepare to build a casket suitable to your needs. Most people buy a casket from a local funeral home. Well you're not most people and that's why you're reading this article. Why are you building a casket? Can you say it out loud? If you need to make something that looks like a casket for a Halloween party or a school play, read the sidebar below and be on your way. If you need a coffin or casket for the "disposal of human remains" as most state laws define the purpose of a casket, your next step is to carefully consider the reason you want to build vs. buy. "I'm not gonna pay a lot for this casket!" Maybe you feel like the old lady from the 1987 Meineke Discount Muffler television commercial, and you want to keep your hard-earned dollars in your purse. If budget is the main reason you want to build a casket, then you need to think about the type of casket you have in mind. Close your eyes and envision this casket. Chances are you can buy the very casket you have in your mind for less than you can build it. More on the cost of building a casket below. Most funeral homes offer an inexpensive cloth covered particle board casket at prices less than $800. Caskets vary widely in style, quality, and price point. If your funeral director only shows you a few models in a narrow price range, ask for alternatives. Most funeral homes offer inexpensive cloth covered particle board caskets at prices under $800. If you're a real Scrooge on this subject, ask your funeral director for a cardboard cremation container for your burial (in a cemetery and most likely in a burial vault). Cremation boxes cost as little as $100. Maybe you have something a little more "distinguished" in mind. 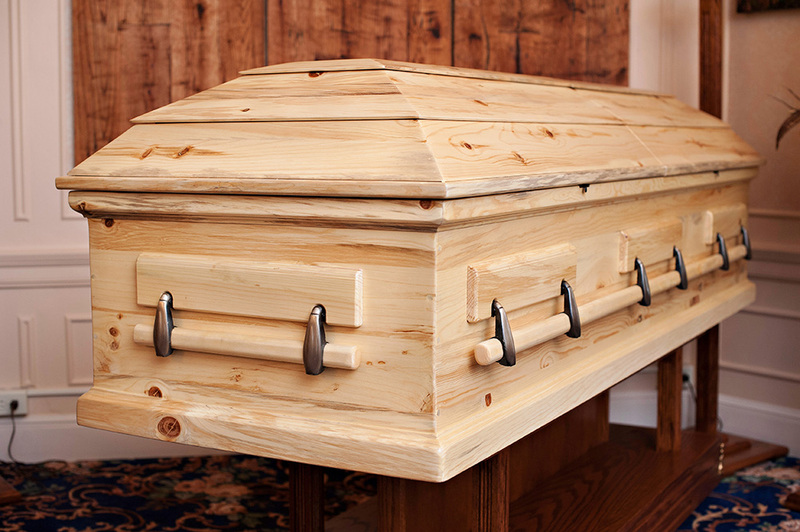 The average price paid for a casket in North America is $3400. 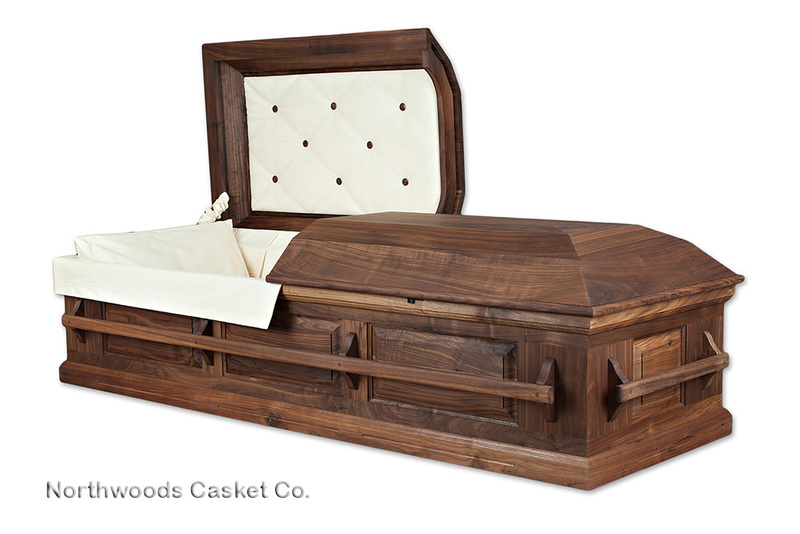 There are many solid wood, modestly priced "pine box" caskets under $2000. If that casket in your mind is a solid hardwood with plush interior, you're looking at prices ranging from $3000 to $10,000 or more. This solid wood, modest pine box sells for $1200. Chances are building the casket you have in mind will not save you money at all. Consider a few of the costs for a wooden casket. A casket requires about 100 board feet (BF) of lumber. Depending on where you are in the US, pine ranges from $0.70 to $2.00 per BF. Oak starts at about $2.35 per BF. So you can expect to pay $200 to $300 just for the lumber! Other hardwoods go up from there. You'll need some hardware including hinges, latches, handles and maybe an adjustable bed. You'll spend $50 to $100 on quality wood finishing materials. As for upholstery, you might spend $100 for enough cotton to make cushions, pillow, lining for the inside side walls, lid panel lining, extendover, and overlay. Before long, you'll rack up $300+ for a modest pine casket with no interior or $1000+ for a contemporary hardwood casket. Prepare to spend 80 hours building your first contemporary hardwood casket. Maybe you possess the skills and the tools in woodworking and upholstery. (You are either a professional craftsman or very talented hobbyist!) Consider the value of your time--what would a professional craftsman charge for these services? Prepare to spend as few as 8 hours to build a plain pine box and up to 80 hours to handcraft your first contemporary hardwood casket. That said, there are other reasons for building a casket. Maybe you're on this journey for sentimental reasons--perhaps a very special person asked you to build this casket. Perhaps you are building this casket for your own end-of-life plan because you cannot find a commercially produced casket that you like. Maybe craft is your therapy, and working with your hands will help you deal with the loss of someone special. Maybe you're thinking about build vs. buy because you have a very unique theme or idea. You (or someone close to you) deserves a casket like no other. A casket out of a catalog simply will not be acceptable. I recommend you consider first calling a casket company (like ours) to discuss your ideas and get some help. We build caskets to custom order for those with specific requests. We can also provide some of the materials and components that might make your job a little easier, and you still get your hands dirty and contribute to the making part in your own creative way. If you are a professional craftsman thinking about getting into the casket building trade, there's a lot more to consider than how to make caskets. Build your first casket or two. And while you're sorting out dimensions, design elements, finishing, and upholstery, start thinking about inventory, sales, marketing, receivables, and the sources of capital that each of these will require. Talk to your local funeral directors. Talk to a funeral supply company. Talk to another casket builder. There are nuances and characteristics of the funeral services industry that make this business very challenging. Making a casket can generally be divided into five steps: (1) casket plans and woodwork, (2) hardware, (3) finishing, (4) upholstery, and (5) accessories. There are DIY casket kits available that can make this all a little easier. Generally, casket kits are for simple pine boxes and pine coffins and will take a few hours to assemble. Whereas, building your own from scratch might take 8 hours even for the skilled craftsman to build a simple pine box for the first time. You'll need some dimensions and casket plans in order to start the woodwork. We call this first building step the casket shell. The casket shell is the output of your wood shop--a complete wooden casket shell assembled, sanded, and ready for finishing. You can buy a casket shell ready for finish, and then upholster and customize with accessories. If you're ready to build your own casket shell from scratch, there are a few books sold by Amazon and Rockler with casket plans and instructions. We offer free plans to build your own casket or build your own coffin. 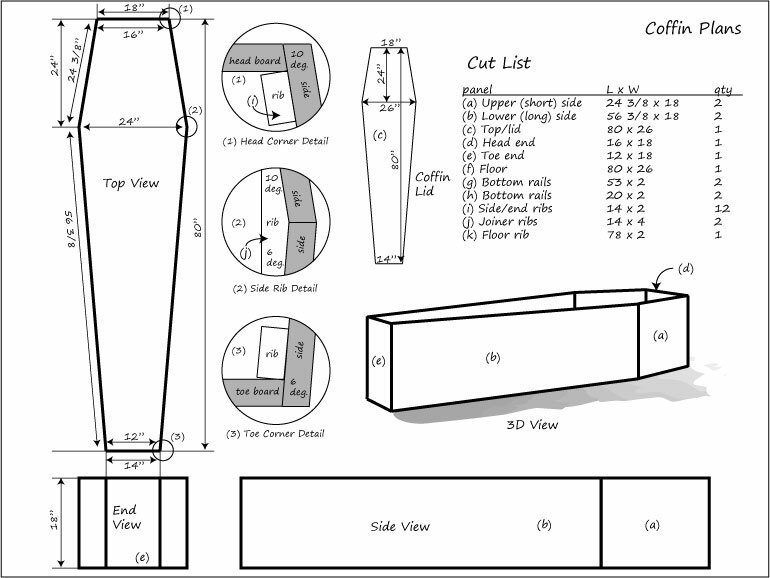 Use these coffin plans to build a simple pine coffin or adapt them to build a fancy hardwood coffin. For the experienced craftsman, you can adapt your own plans with basic wood joinery and cabinet making techniques. If this is you, you're probably looking for rough dimensions. A casket needs to fit into a standard burial vault. A standard burial vault is 30 inches wide and 84 or more inches long with at least 24 inches of depth. For safe clearance, your casket should be no more than 29 1/2 inches wide. A casket of 78 to 82 inches in length should easily accommodate 99.99% of the population and a depth anywhere from 16 on the low end (no adjustable bed, modest pillows) to 24 inches is suitable. You will need some casket hardware available in different styles and finishes. 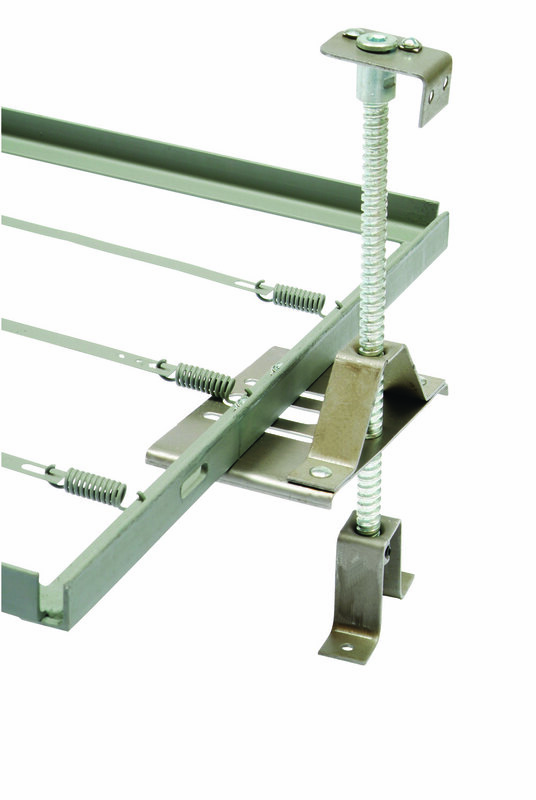 These components include hinges, latches, handles, and adjustable beds. Starting with the hardware necessary to secure the casket lid, there are special separable hinges designed to make it easy to remove the lid for finishing and upholstery. You could use almost any type of hinge, but these make it easy and they are not expensive. Separable hinges are available for edge-mounting (over the edge of a 3/4 inch thick board) or flush mounting to the top edge of the casket sidewalls. The hinged lid is secured from falling open or closed with a lid top support. These come in zinc with two types of anchor mounts for either flush-mount or side-mount applications. Casket latches secure the lid closed. These are inset in the casket wall with a bottom plate, lever, and top plate secured by two screws. The pin then screws into the lid. You can read more details and see photos on our casket latch listings. The casket hardware kit shown on this page has all parts for both edge-mounted and flush-mounted hinges, both side- and flush-mount top support, and lid latches plus all of the screws you need to secure all of the parts to the casket (screws are not shown in the photo above). All of these parts are optional if you are building a simple pine box with a removable lid you intend to secure closed with screws or nails. Casket with swing bar handles and escutcheons. While some European caskets do not have handles, most caskets do have handles for practical reasons. There are several styles of solid mount or swing bar handles. You can fabricate your own or choose from what is available at your local hardware store such as large drawer pulls or door and gate pull handles. For a more casket-like appearance, you will want to use swing bar handles. Swing bar handles are composed of a metal swing bar bracket, an oval or round shaped wooden handle, optional end caps and optional escutcheons (to cover the mounting holes of the swing bar metal brackets). Swing bar brackets come in styles with an adapter or without an adapter. The style without an adapter requires an escutcheon cover instead. Adjustable casket bed shown with lift mechanism and steel spring bed. Another optional hardware component is an adjustable bed. Most contemporary caskets include an adjustable bed to make it easier for the mortician to raise or lower the body in the casket for an open casket viewing. An adjustable bed includes two screw lift mechanism and a bed platform. The bed platform can be made from plywood, but most caskets include a steel spring bed. There's nothing unique about finishing a casket that's different from finishing any other piece of fine wood furniture. You'll have to research wood finishing techniques as that topic is beyond the scope of this article. See our series of articles on natural finishes. As for the products we use to finish caskets, there are a few we particularly like. We choose to use environmentally friendly, zero-VOC finishes on all of our caskets. This is good for our health, and for the environment. We use a variety of both water-based and natural oil finish products. General Finishes (East Troy, WI) has developed a series of water-based zero-VOC stain and paint wood finishes. We like their RTM stain, dye stain, and milk paints. These products can be applied by hand with a brush, but we find they all perform better with an HVLP Sprayer. Rubio Monocoat USA has developed a zero-VOC, fast-setting, natural oil finish. We apply this by hand and buff leaving a durable finish that can be completed in less than one day. For some of our vintage inspired craft caskets, we use the real deal--old school pure oil finishes. These are not easy to find at your local hardware store, so we source and retail these products from the Real Milk Paint Company. One of our favorites is Dark Raw Tung Oil. These oil finishes will take a few days to cure on pine and could take 2-3 weeks to fully cure on hardwoods like maple and cherry. The natural oil can be applied and burnished or top-coated with wax for a higher shine. We sell some of our favorite natural finishing products on our CarriageHouseWorks Etsy store. We receive many inquiries from woodworkers regarding casket upholstery. There is a very wide range of casket interior options from none at all to elaborately tailored. Conventional caskets are upholstered with synthetic fabrics for reasons including low cost, durability and no wrinkles. You'll find many trade names for these synthetic fabrics used in casket descriptions that include taffeta, crepe, plush, twill, and velvet. None at all - For a modest, closed-casket ceremony, the deceased can be gently laid to rest in a pine box without any interior upholstery whatsoever. Repurposed - Re-use mattress, cushions, bed pillows, sleeping bag, or a quilt. Burial Shroud - Wrap the deceased in a burial shroud. Minimalist - Buy three simple casket cushions and a pillow. Fully Upholstered - All the upholstery parts to fully line the inside of the casket. Vintage illustration of casket parts nomenclature. Many families take great care to memorialize their loved ones with a personalized casket. An easy way personalize a casket is with add-on accessories. Whether you opt to buy, or creatively re-purpose or hand-make your own, you will be creating an experience your family and friends will not easily forget. One very common casket customization is cap panel displayed inside the casket lid when the lid is propped open. Most casket manufacturers offer a wide variety of custom embroidered, tailored, or screen printed cap panel inserts. Ladder No. 9 - customized casket with hard maple "ladder" handles and Fire Department crest embroidered in the cap panel. Another way to customize a casket is with fabric accessories including an overlay, extendover, and pillow sash. These can be used in either an open, or closed-casket funeral service. The accessories can optionally be kept by family members are keepsakes. Displayed here is a US Marine Corps casket accessory set including starts & stripes overlay, extendover, and pillow sash adorned in USMC custom embroidered patch.